My Felt B16 TT bike inside the Bike Bag. I bought the bag at www.wiggle.com and it is heavy – 13.5kg. For sure the weight of the bag together with the bicycle, it will be an excess weight of more than 20kg. I have to pay B$180 at Brunei Airport for 2 overweight bike bags. At that time we were travelling 2 person because Zaeidi is coming down to Singapore the next day. If it was 3 persons, then I don’t need to pay as much. Ali checking in Zaeidi’s bicycle. It was raining during the check in. My Felt B16, Azizul’s Scott Plasma and Sharif’s Cervelo P2C. We were in the same group age of 35 to 39 years. We didn’t choose to park our bicycles together, the Organizer did. Zaeidi’s Pinarello and JJ’s Cervelo and next to it is the Yellow Cannondale. A long queue at the toilet. I guess a lot of them had the case of a bad athlete stomach. I really hate the swim and I was glad it was over. I even managed to talked to one of the athlete during the T1 about the swim. By the time Zaeidi come out of the swim, his time was 1:29:36 and luckily he wasn’t disqualified because he missed the cut-off time. The bike rack was almost empty. Some area of the bike route we cannot pass each other but since it is a race, nobody really cares. I’m not going to follow a slow cyclists doing 27km/hr even though it is a no passing zone. It was a 90km bike route (30km X 3 laps). Honestly saying, I did not really push myself to hard on the bike leg. You can say I was ‘cruising along’. My time for the bike leg was 2:56:55 (still within my target time of 3 hours). My average speed was 30.52km/h. Even Hamsul’s bike time was even faster than me (2:47:01). I did not want to push to hard since this is my first 70.3 Ironman and I don’t want to get a cramped. Getting a cramped on the bike leg will destroy the run and I don’t want that. Its no use going faster on the bike and hurting on the run. I’ve experience it a few times already and I don’t like it. Zaeidi’s time on the bike was 2:30:56 and within his target time of 2:30. He managed to overtake me during 1st lap of the bike leg. Zaeidi also got a YELLOW card by the Marshal maybe due to ‘blocking’, ‘illegal pass’, ‘illegal position or ‘littering’. The penalty was a STOP/START at the Penalty tent but he did not report to the penalty tent causing him to be disqualified (DQ) after the race was over. I was very very happy with my run. My target time was 2:30 and I managed to do it 2:19. I ran all the way and only stopping over at the water checkpoint and a few short break to the toilet. I thought my overall time was below 6:30:00 – my target time but it was a little more than 3 minutes. The swim really mess up the time. My target was to get under 1:00:00 but it didn’t went out the way it should be. 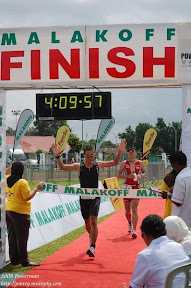 Overall I was HAPPY but I feel I am not ready for the FULL IRONMAN. Well done AP! I salute!